Celestron presents a new spotting scope with advanced features of clear view and quick targeting. Celestron 52250 80mm Ultima Zoom spotting scope is available with wider 80 mm diameter lens. Ultima 80mm has been designed with new features of 45 angled eyepiece for comfortable view of the target. 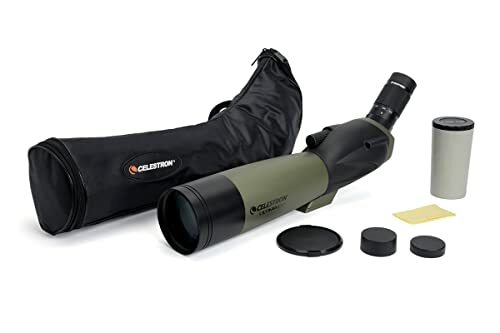 Celestron 52250 80mm Ultima is very easy to carry and simple to operate due to its latest style portable and durable packing and standard eyepiece with zooming power of 20-60x. Excellent light transmission due to 80mm lens diameter which give 77% best viewing results as compare to the entry level scopes with 60mm lens diameter. 45o eyepiece is comfortable to keep on viewing for longer time after fixing on short or long tripod. Moreover, the plus point of 45o angled design is that I can attach a mini camera on the eyepiece to capture the scenes. Heavy duty scope with strong metallic body and heavy in weight for best to use during hard weather conditions like gusty winds and rains. Compatible with multiple tripods to use for all types of surfaces including landscapes, coastal areas, hills and forests. Long sight tube is best feature for wildlife fanatics for close observation of animals from longer distance because 20 inches long sight tube headed with 80mm diameter optic lens produce very clear view even in deep woods. Being heavy duty scope, the product comparatively weighs high but still easy to carry in soft carrying case. For every new version of spotting scope, Celestron focus on the weak areas highlighted by the users through user comments against the previous version. Company also encourages good as well as bad comments to minimize the issues regarding use of the product. Using the same strategy, Celestron has added some new features and also improved few of the features from previous version of spotting scopes. 1. 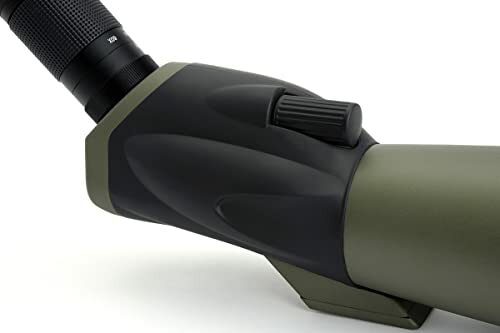 Celestron 52250 Scope has been manufactured with attractive grey color exterior that looks awesome and match with different locations and equipments. This aspect of the device is a unique quality because traditionally, the spotting scopes are manufactured with matte finish color. 2. 20 inches long body structure of the Ultima 80mm spotting scope is its unique quality because most of the spotting scopes are approximately 18 inches long. Lengthy body structure enhances the viewing quality at longer distance more. 3. Celestron 52250 Spotting Scope has been manufactured with 80mm diameter lens that is wider than the previous versions. Wider lens is more powerful than the lenses with 60mm diameter. 4. 45o eyepiece of Ultima Zoom is more comfortable to focus on the target for longer time. Spotting scopes having straight eyepiece usually create problem while focusing on the target for longer time. Moreover, angled device can be adjusted with multiple styles for clear view of locations. 5. The reliability of any product rests with the material used for manufacturing as more material results in more weight of the product. The displayed weight of Celestron 52250 spotting scope is 4.9 pounds proves that the product is exceptionally reliable and has been manufactured with strong solid material. 6. Due to long body structure and multicoated lens the scope is more powerful and provides brighter image even in dim light of dawn and dusk. 7. Celestron 52250 Ultima is compatible with various cameras providing you with the facility to capture the long distanced scenes with very close view. 8. This strong spotting scope is compatible with heavy duty Slik tripod stand which is adjustable for multiple height levels. Being mounted at strong tripod viewing the target from different angles becomes easier. The basic quality of this product is long sight tube and total length of the scope that is 20 inches. Most of the spotting scopes are manufactured up to 18 inches length. The product has enhanced size optic lens with 80mm diameter. Entry level spotting scopes are manufactured with 60mm lens diameter. Celestron 52250 spotting scope is a heavy duty product for wildlife studies and combing purpose. Weight of the product is approximately 4.9 pounds. Most of the spotting scopes are manufactured up to one pound weight. Such scopes are not good for hard weathers and hard surface missions. Due to the popularity of Celestron 52250 spotting scope, many companies have manufactured tripod stands compatible with this scope. So, user has variety of options to select tripod stand according to the nature of use. Selection of tripods is limited for most of the scopes because companies manufacture the accessories according to the popularity and demand of product. More demand tends the companies to make accessories. Image quality is best of all entry level scopes due to enhanced lens diameter. Viewing quality is the major problem with most of the entry level scopes having 60mm diameter optic lens. I have been using light weight scopes with mini tripod stand to view natural scenes before purchasing Celestron 52250 Ultima Zoom. I couldn’t get the required results from those scopes for what I wanted. After reading about the unique qualities and excellent performance, I purchased this product. A wider lens (80mm diameter) as compare to the previous scopes is better than the scopes having 60mm diameter. I felt a real difference between the view of previous scopes and Celestron 52250. Even at longer distance, I could see the movements of animals and birds more clearly. A feature of this product I liked the most is that this scope is compatible with cameras. Now, I can leave the device by fixing a camera to capture the images to view later on. I just fix a camera on the scope to capture beautiful scenes while I can perform any other activity. Reliability of the product was a real problem with previous devices I used but having this product I am fully satisfied that the product is strong and heavy enough to be safe from damage in hard areas and hard weather conditions. Fixing on a Slik tripod is very easy and trouble free due to heavy weight (4.9 pounds) of this spotting scope. As the device is heavy, strong and large in size as compare to traditional spotting scopes; so, I can leave the scope to work even in heavy winds and bad weather conditions. 45o eyepiece of Celestron 52250 80mm is more comfortable as compare to straight one. While using a scope with straight eyepiece I needed to bend my neck to view different locations. With this angled scope I can view comfortably because I do not need to bend my neck to take position behind the scope. Celestron 52250 80mm scope is my great companion for any outdoor activity because of durable and portable refractor design. There is no heavy box to carry this scope for outdoor activities. I just hang the scope around my neck with its built-in strip and move through the landscapes or mountains. The product has been manufactured with large diameter lens for clear view at longer distance. Wider lens with 20-60x magnification produce best zooming results for clear view of target. Strong and heavy duty material is used for manufacturing this device which ensures durability even while using in hard weather and rough lands. Compatible with strong tripod provides me with great comfort to enjoy the natural scenes. Body structure and scope tube is longer as compare to other spotting scopes enhances the viewing quality of the scope. Moreover, optical quality of this scope is much better than the scopes with 60mm diameter lens. Almost view is 50% much clear and brighter than the traditional 60mm scopes. Allow camera to fix with the device is helpful to capture situations and scenes from longer distance. This feature is best for combing, hunting and birding purpose. Making documentaries and research on creatures has been made easy with Celestron 52250 Spotting Scope. Magnification setting is simple because the adjustment knob is located next to the eyepiece. Although, the product is best to use for multiple situations; however, some user complain for its weight that is comparatively high. The device is little bit difficult to carry while proceeding for adventures to hill stations or rough landscapes. How to mount Celestron 52250 80mm Ultima Zoom Spotting Scope correctly? Maintaining a Celestron 52250 scope on a tripod is so simple and takes minimum time. As you know that Celestron Ultima is compatible with many heavy duty tripods including Slik heavy duty and Slik Heavy duty mini, I have both the Slik made best quality tripods (3-way fluid-effect Head and Built-in Bubble Level and Slik Mini-Pro V Tripod with 2-Way Pan/Tilt Head). I use both the tripod stands for adventure and combing missions and keep both along with my luggage while proceeding on missions. I like Slik Made tripods because they are reliable and best fit with my Celestron scope. Mounting procedure for both the tripods is same with little alterations of height adjustment. Below is the procedure I use to mount the Ultima spotting scope on a tripod. To fix my Ultima spotting scope on Slick tripod, I adjust the padded feet on hard surface ensuring the secure footing. I spread the legs of tripod at appropriate height and lock. I find Slik heavy duty tripod much easier to fix Celestron Ultima as compare to other tripods. I can easily remove and reinstall the large quick release plate of the tripod to fix with the scope. I simple mount the spotting scope on the fixing plate of tripod and reinstall on the tripod stand. The mounting procedure on the tripod plate is same like other stands. I just drive in the screw of the plate in to the scope female part and tighten to ensure the proper installation. I take minimum time to mount and adjust the spotting scope on Slik tripod stand. After fixing the scope, I make further viewing adjustments by elevator handle which allow up down and rotational movements of the fixing plate of tripod. As you know that Celestron has manufactured the Ultima scope with strong metallic material resistant against shock, still I take precautionary measures while mounting the scope on tripod stand to prevent any mishandling that can lead to withdraw of warranty. Below are some important precautionary measures that I adapt while fixing my Celestron 52250 spotting scope. Celestron 80mm has an additional full length eyepiece covered for extra protection. To protect the most important and sensitive part (eyepiece and lens) I always keep the covers on while mounting on tripod. Although, the scope can be mounted without removing the large adjustment plate of the tripod; however I remove the plate and fix with the scope by making a comfortable position on the ground. I take this precaution to avoid any damage due to falling of the scope on ground accidentally. To maintain the mounting sequence and to save the scope from dust, I spread a sheet on the ground when I need to fix the scope in field areas. ​How to use Celestron 52250 80mm Ultima Zoom Spotting Scope perfectly? 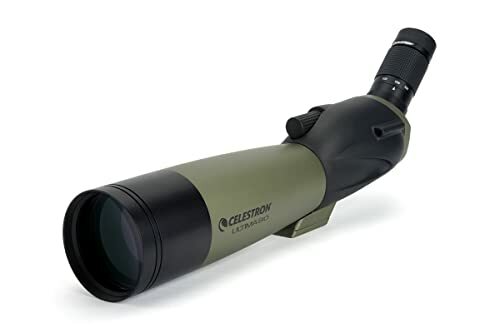 Celestron 52250 spotting scope has been manufactured with simple operation and an individual with little knowledge about spotting and scopes can easily use this product. As I have used many spotting scopes in my life; so, I am confident to say that 52250 Ultima scope is simpler than all the scopes I used. Although, you can get the exact idea for the using this cope while holding in your hands; however, I have tried to explore the operating procedure of Celestron 52250 Ultima helping you to get an idea. After mounting the scope on a tripod, I adjust the Ultima scope towards the particular direction I want to view. I make the direction adjustment with the help of elevator handle particularly designed for up/down and rotational adjustments. I start viewing the objects with 20X magnification because I can see large area to select a required location. After that I can extend magnification level to 40X and than 60X for close observations and analysis. For fine adjustment, I use target adjustment knob located next to the eyepiece directly on the upper part above the mounting position. After setting magnification level, adjustment knob helps to make the view clear quickly. I use elevator handle of the tripod to view different locations and for scanning the areas. Whenever I want to capture scenes, I just fix my camera on the scope eyepiece. The scope produces best results for capturing the scenes even at longer distance. ​How to maintain Celestron 52250 80mm Ultima Zoom Spotting Scope? Proper maintenance and handling increase the efficiency of the product for longer time. Believing on this phenomenon I can’t compromise on its safety. That’s the reason my scope is working properly and providing me with best results for what I have purchased it. No mathematical science is required to maintain a Celestron spotting scope because the device has been manufactured with strong and powerful material; however, general maintenance is mandatory. The device is made with strong metallic body and heavy resistant against entrance of water, fog and dust; yet I keep the lens and eyepiece cover on unless I need to use. After completion of mission, I clean the scope lens with soak paper dipped in alcohol or simply with lens cleaning paper. Celestron spotting scope is guaranteed for waterproofing but I do not use water for cleaning the exterior of the scope. The exterior of the scope is matte finished and simply can be cleaned with piece of cloth. Usually, I use handkerchief to clean the dust or finger prints from the outer parts of the scope. I know that focus adjustment knob is permanently lubricated for smooth movements; so I never tried to re-lubricate the knob. Can I purchase the Celestron 52250 Ultima scope while being outside USA? Currently, the product is available for shipping within USA and some APO/FPO addresses. However, warranty claim for selected countries other than USA cannot be entertained via amazon. Such customers need to contact directly to the manufacture regarding warranty claims. How can I take pictures through Celestron 52250 scope? Celestron 52250 Ultima scope is the product for viewing and spotting. In the other words the product is a viewing aid and it does not have the feature to take pictures. However, you can capture images by adding a camera with the eyepiece of this scope. To attach a camera with the scope you need a T-ring adapter to capture the things located at longer distance as the scope provides zoomed image to the eye of camera. How can I claim warranty in case of any issue with Celestron 52250 Ultima spotting scope? Amazon assists the customers to claim the warranty liable to the product winder but it is only for the customers within USA. For the customers outside USA (for selected countries only) customer need to directly contact the product winder for claim. So, before purchasing the Celestron 52250 take a look on the conditions regarding warranty for your region. I have read that Celestron Ultima scope is best for wildlife studies, landscapes and mountains. Why I can’t use this scope for exploring a city? Definitely, you can use this scope for exploring a city. However, the scope covers less distance as compare to rural areas due to impurities in the visual field. Does this spotting scope come along with tripod like other scopes? No. You need to select and purchase a suitable tripod according to the nature of use. Usually, the tripod coming with the scopes are terribly weak and useless. So, I recommend purchasing a suitable tripod which suffices your requirements. How much I will have to pay along with shipping changes for the product? Presently, the product is costing $ 169.95 only with free shipping within USA. For the selected countries outside USA, the shipping charges vary from country to country and from region to region that you can know while placing your online order. Being heavy and difficult to carry is the only con raised by some users. The nitpick is due varying choice from individual to individual ; however the professional users always prefer heavy duty scopes to fulfill the requirement of adventuring , hunting and combing the hard areas. 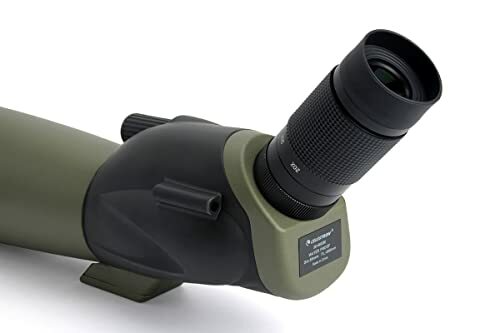 As per my observation and practical experience with this scope, I am fully confident that Celestron 52250 80mm Ultima Zoom is the only spotting scope with long sight tube and large diameter optical lens to view image more clearly at longer distance and is best for studies and adventures.